Did you know that aliens have visited us in the past, and are among us now, but we don't know it? It has to be true because I saw it on YouTube. (I also obtained from there proof the earth is flat and life evolved from a primordial scum.) Some people are gullible, and this can be seen when they want to prove evolution, and have evidence of imaginary invisible friends from outer space. Put fake news in video format and show the world? Sure, the end justifies the means for some owlhoots. Here is where I get into some critical thinking with y'all. Ask yourself some questions, such as, "If space aliens are such a secret, how does the video maker know?" 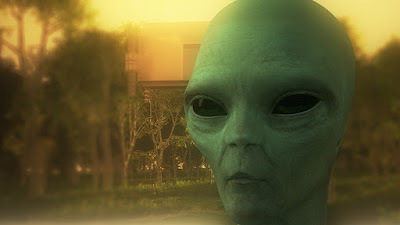 From some of the stories about such aliens, you may want to ask, "Why is the video maker still alive, and why wasn't the video and all evidence destroyed?" Some folks don't cotton to having their secrets revealed, after all, so it seems unlikely that such big secrets are being revealed. Here is a video that has seventeen claims in ten minutes, and the maker seems intent on convincing us of ancient alien visitations. I'd be much obliged if you'd watch it, see what errors in reasoning you can catch, and then read what I came up with. Deal? I'm going to indulge in some reification for the sake of convenience. That is, I'll say "the video" instead of "the makers of the video" and things like that. It starts out with words like maybe, perhaps, seem to, and so on. While the video pretends to leave it up to the viewer to decide what the evidence indicates and asks what you believe, there is clearly an agenda behind it — especially with the claim that aliens have visited Earth in the past. Many questions came to mind: Do historical records or even long-standing legends that pertain to the structures, artwork, and so forth exist? Did they mention aliens, "gods", and that kind of thing? Did they have more prosaic explanations that the video conveniently neglected? Historical records can be very helpful. First, "there is no denying" that paintings depict ancient aliens. Interesting that the video mixes ancient pictures with modern fantasy art (some of which you might find at Pixabay), which strikes me as a bit misleading. Some of the statements do not allow for alternative explanations, such as when art supposedly depicts "beings in protective suits". That is the only possibility? (This is something that evolutionists use as well: only presenting the possibility that suits their conjecture.) A comment was made that there are plenty of pictures “that we’re not even aware of”. So how do you know, kitten? A claim that government files were opened, and then the video shows pictures that are not from government files. More fantasy art and such. Many sightings of UFOs have indeed been explained, but some are not so easily dismissed. Therefore, aliens. No, therefore the bifurcation fallacy. Here are some articles on aliens that you may want to consider. Big rocks that didn't roll in the old Inca capital's fortress. The stones are fitted together perfectly. (I guess we have to take the video's word for that.) A remark about the "rope and lever" method of transport is mentioned dismissively. It does not prove aliens were involved. Paul Hellyer is the former Canadian Minister of National Defense. We are asked why he would say something that could ruin his reputation. Red flags there, it is an appeal to motive fallacy as well as an appeal to authority. After all, this government official says something that fits with the video's agenda. “You really want to believe him”. Why should I? We are also told that he is active in the UFO community, so that shows a bit of a bias. He says there eighty species of aliens, and they want to help humanity. How does he know these things? Who supports him aside from other UFO enthusiasts? Another segment about paintings and drawings, and this is very brief. The Madonna with Saint Giovannino by Domenico Ghirlandaio is referred to as "The UFO Painting" because some people think it depicts a space ship in the distance. (As if Dom just sat there and painted a space ship, and the pilot was considerate enough to pose.) The prosaic explanation is waved off in favor of the sensational view. Here we go with rocks again. "How it got there, no one will ever know." Maybe, maybe not. Because of the way the contents of the video are framed, this is almost an argument from silence, implying it must be the work of aliens. The segment on our galaxy being suited for life has been discussed by Christians and creationists for many years. It is a teleological argument, and does indeed show that our Creator knew what he was doing. We are then told that our galaxy is not hospitable to aliens, but other galaxies are suited to their existence. How do you know this? Those strange assertions are based on unknown presuppositions about alien life. Apparently, someone didn't do some research, because the opposite is true. By the way, it seems that UFO enthusiasts are unaware of how large our galaxy is, and the distance between galaxies. Then some people believe the line, "I have come from another galaxy to guide you". Oh, shut up. No, you're not. Next time, bring bacon wraps and tell the truth. I like bacon wraps and the truth. Next up for bidding is the segment on the Nazca lines, one of the "best examples" that aliens visited Earth. Not hardly! I first heard this line (see what I did there?) from Erich von Däniken, who has some serious problems with facts and logic. He doesn't seem to be taken seriously outside the circles of his fans. As with so much of the material in this video, the Nazca Lines can be better explained than by their being the work of aliens. More structures. This time, Pyramid of the Sun, in Teotihuacan, Mexico. Nice buildings, well put together and solid. The video says the pyramids are aligned to a planet. I wonder which one? Also, these buildings were not possible with ancient technology, especially since they assume that humans were freshly minted from evolution, and were pretty much stupid. (Actually, humans have always been smart.) So, the pyramids were too advanced for pre-Aztec Mexico. But that is an assertion based on the presumptions of evolution and ancient aliens. This video majors on big rocks and ancient buildings. This time, Bolivia. The temple complex had (guess what?) heavy rocks. Seems like people didn't contract out to the cheapest bidder, but wanted quality work that would last a mighty long time. I suspicion they expected to be using such things indefinitely.“Rogue historians are convinced aliens assisted in building this near-flawless site”. Yeah, we've seen what kind of scholarship those tinhorns produce. I'm almost hearing, "They may be nutty, fringe historians, but they agree with our preconceptions, so they're valid. Unnamed, but valid". My cynicism is creeping in here, isn't it? Stonehenge! I would have been disappointed if this classic of ancient alien mythology was omitted. It was a landing pad for spaceships. No, it was an observatory. Wait, it was... At any rate, it must have been built by aliens because humans were stupid back then. Don't be too sure, Shirley. A sarcophagus lid in a distant jungle supposedly shows someone operating controls of a space ship. It is “proof of alien interaction with humans –according to alien theorists". Notice the claim, and then backing off again by adding the "alien theorists" part? Still, the video is using loaded terminology and steering the viewer to accept this "evidence" of aliens. It seems to do that quite a bit. Great balls of stone in Costa Rica. This tiny segment talks about big balls, little balls, apparently made by hand. They excited alien theorists. Of course, since those people seem to be too biased to consider other options. At least, this is the impression I am getting from this video about alien theorists. Speaking of balls, how about Ball Island? Wonder why this island in the Tasman Sea has such a name, since it is in the shape of a pyramid? The assertion is that the island is too flawless to have been made by nature. Implied is, "Therefore, aliens". There is a reference to dragons because if you squint just right, something looks a little like a claw. Maybe the island was built by dragons. How about very clever birds? Crows, ravens, blue jays, and the like are rather smart, you know. As a Christian, I'd be a mite reluctant to visit Baalbek in Lebanon. The Baal part of the name is not a coincidence with Old Testament demonic cults, after all. Anyway, we have more big rocks. Again. This is allegedly a landing site or beacon for alien aircraft. (How do you know that?) It would also be a challenge to build today. So, that leaves aliens, again? Egyptian hieroglyphs have an assortment of objects, and some of them resemble modern vehicles. And spacecraft. Must be aliens, since there is no other explanation. Sure, buddy. Lots of rocks, buildings, and a bit of art. Several segments could have been consolidated. Did you notice that some of the segments were tiny, about fifteen seconds long? Yeah, there's some compelling evidence, Hoss. This video is for modern people with short attention spans. Serious claims would require longer, more detailed videos that involved research. The video was saturated with circular reasoning (assuming ancient aliens to prove ancient aliens), and ignoring other possible explanations. A great deal of the video is based on evolutionary presuppositions, especially that humans were stupid brutes way back yonder. That concept keeps on putting a burr under the saddles of evolutionists. Do some research from less gullible places and you'll see that many of the mysteries do have explanations. The same goes for claims from evolutionists who are funded by our tax money. I strongly recommend that people ask questions about origins and consider other explanations, especially form biblical creation science sources. I hope my remarks rejecting visitors from outer space haven't alienated y'all. I'll allow that I was unable to remain objective because I was put off by the video, which I found very unconvincing. And I'm biased by my biblical creationist worldview, where I lack belief that God made intelligent life elsewhere in the universe. Anyway, I have something for you to try your hand with a short video about five alien species that live with us today. Then, use some critical thinking when encountering "evidence" presented for goo-to-you evolution.